In 2009, the NFPA or National Fire Protection Association issued new recommendations pertaining to the marking of fire trucks (apparatus) and emergency vehicles. The most significant change is the addition of rear chevron markings. In summary, the NFPA 1901 guideline says that a fire truck or fire apparatus should have a reflective chevron pattern applied to at least 50% of the rear of the vehicle. The stripes need to be Red and Yellow in a type 1 or better reflective material. The width of the stripes should be 6″ wide. They should slant down and outward at a 45 degree angle. For pickup trucks and SUV’s a rectangular chevron panel is often all that is needed to fulfill this recommendation. 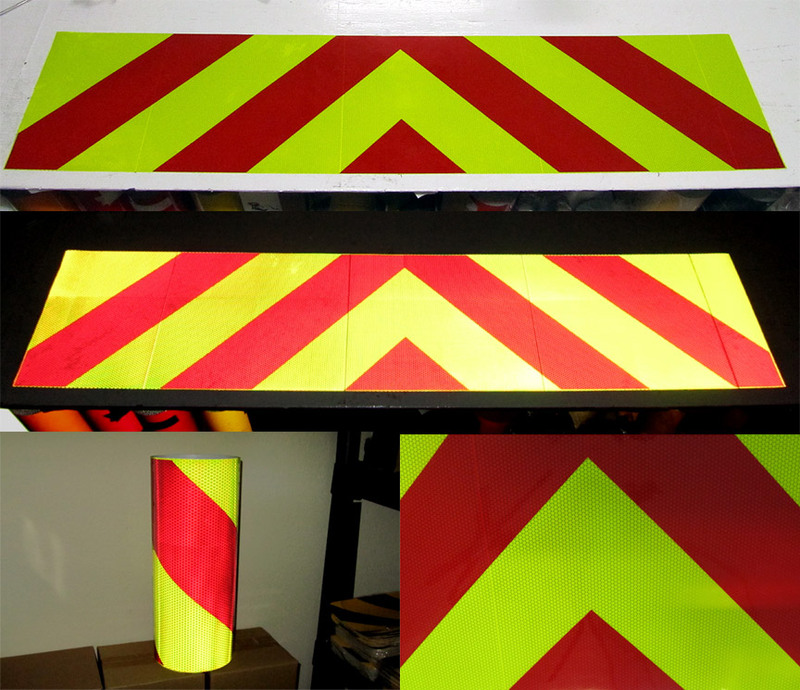 We carry premade Reflective Chevron Panels that are easy to apply and far exceed NFPA requirements. The panels are based on a Reflexite V97 or V98 Fluorescent Lime Yellow material. A transparent overlay is applied to create the red stripes. The panels are self adhesive with a peel off wax paper backing. If necessary, the panels are easy to trim so that they go around obstacles like latches and emblems. A pair of scissors or an exacto is all you need. 12″ x 6′ panels run $125 each and 16″ x 6′ panels run $150 each. The panels can be ordered by going to www.colebrothers.com/chevronpanels or calling 850-934-3157. Steven Cole (Economics, MBA) 22 years experience in the reflective safety business. Owner of Reflective Inc. Sponsored by Reflective Inc. Distributors of Quality Reflective Tapes since 1998. For information on our products "CLICK HERE"